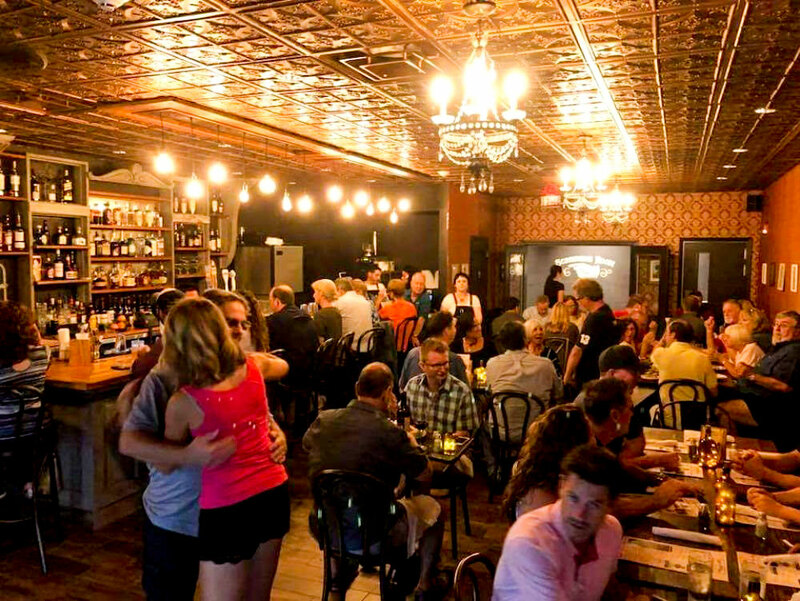 If you wanted a cocktail in the late 1920s, you’d ask for a “giggle water”; an alcoholic beverage and the namesake inspiration for Gigglewaters, the restaurant, bar & one screen classic movie theater in the heart of downtown Safety Harbor. When owners Richie Wilson & Rachel Fine moved to Florida from Brooklyn in 2015, they were happy to trade snow for sunshine. But they missed some of their favorite New York City haunts and started conceptualizing a way to bring some of those best gems together to create a truly unique dining and entertainment experience for their new hometown. They decided to create a speakeasy-style establishment that celebrated the prohibition era with some modern industrial twists. Tin ceilings, Edison lighting and a custom bar built from Biltmore doors & wood, circa 1897.